This week I listened to some Christmas music every day. Considering that Christmas Stuff went up in many area stores before Halloween, this may not seem groundbreaking to you. For me, it was. I’m an Advent Chick. I LOVE the four weeks leading TO Christmas. I love the purple and blue. I love lighting my Advent wreath. I love the stillness and watching and waiting. So I usually wait to tune into Christmas tunes til – well, til Christmas. This year is different though – on a lot of levels. There’s a lot of stillness and watching and waiting going on in my family. My spirit is on the mountaintop one minute and in the ditch the next. Last Sunday, as I was helping my sweetie decorate his Christmas tree, we listened to Christmas music. I was gobsmacked by how much it shifted my spirit. So I decided to tune in for a few minutes each day and see what happened. As I type this post, chestnuts are roasting on some open fire somewhere and knowing that reminds me that there’s a lot of cool stuff going on outside my little world. I’ve let go of any remnants of guilt I felt over ‘cheating Advent’. It’s not like I’m living in the mall or anything. I’m just allowing something joyful to be joyful for me – even when I don’t feel joyful. 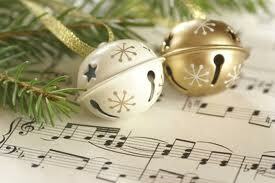 The Christmas Music might not help me feel joyFULL, but it does help me feel JOY. That’s a start, isn’t it? How do you find JOY? And hey, while you’re responding, what’s your favorite Christmas song? I LOVE this experiment! 🙂 And I find that the Christmas lets me really appreciate Advent by reminding me of all I am anticipating! As for finding joy, I have been living my “life verse” from Psalm 46:10: Be still and know that I am God. Learnng to be still and enJOYing it has been a wonderful lesson and experience for me! And my favorite Christmas carol is The Carol of the Bells! As a matter of fact the Trans-Siberian Orchestra version is my phone RingTone and RingBack for the Advent/Christmas seasons!